After your tomato and pepper plants get established it is time to consider cages. To cage or not to cage your tomatoes. Well I say it depends. We cage the large indeterminate heirloom tomatoes. We typically don't cage the smaller determinate roma tomatoes. I have made cages from concrete reinforcing wire. The are typically about five feet tall and two feet in diameter. They have six inch openings to reach through to pick fruit. We stake the cages so they don't fall over in the wind. I bought a 150 foot roll of wire at Menards to make the cages. I cut them with a bolt cutter and wrapped the wires around the opposing end with a fencing pliers. 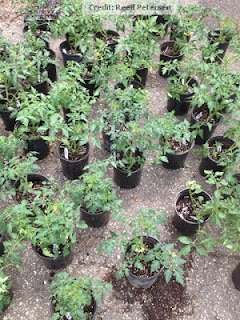 I don't use cages on the roma tomatoes and just let them sprall because they are compact and close to the ground. I also let cherry tomatoes spread out on the ground. Though we do put the cherries on row covers. We use the small three ring cages that are sometimes call tomato cages to support the taller hot peppers such as Serano.